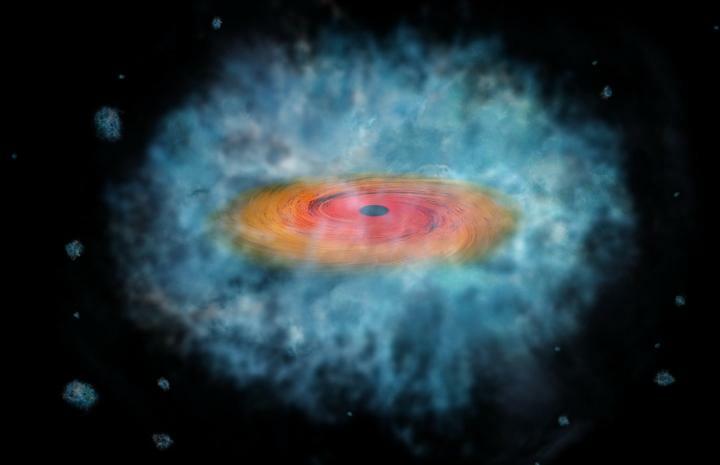 Astrophysicists have taken a major step forward in understanding how supermassive black holes formed. Using data from Hubble and two other space telescopes, Italian researchers have found the best evidence yet for the seeds that ultimately grow into these cosmic giants. For years astronomers have debated how the earliest generation of supermassive black holes formed very quickly, relatively speaking, after the Big Bang. Now, an Italian team has identified two objects in the early Universe that seem to be the origin of these early supermassive black holes. The two objects represent the most promising black hole seed candidates found so far . The group used computer models and applied a new analysis method to data from the NASA Chandra X-ray Observatory, the NASA/ESA Hubble Space Telescope, and the NASA Spitzer Space Telescope to find and identify the two objects. Both of these newly discovered black hole seed candidates are seen less than a billion years after the Big Bang and have an initial mass of about 100 000 times the Sun. "Our discovery, if confirmed, would explain how these monster black holes were born," said Fabio Pacucci, lead author of the study, of Scuola Normale Superiore in Pisa, Italy. The new findings support another scenario where at least some very massive black hole seeds with 100 000 times the mass of the Sun formed directly when a massive cloud of gas collapses . In this case the growth of the black holes would be jump started, and would proceed more quickly. "There is a lot of controversy over which path these black holes take," said co-author Andrea Ferrara also of Scuola Normale Superiore. "Our work suggests we are converging on one answer, where black holes start big and grow at the normal rate, rather than starting small and growing at a very fast rate." Andrea Grazian, a co-author from the National Institute for Astrophysics in Italy explains: "Black hole seeds are extremely hard to find and confirming their detection is very difficult. However, we think our research has uncovered the two best candidates so far."